The non-horror enthusiast wrinkles his nose and asks me, “Why do you write that stuff?” How dare he! His subtext being that horror is inherently lesser than “literary” endeavors. In answer, I’ll recite the standard defense: horror is a commentary on modern life; horror is a reflection and metaphor of societal fears. Now that’s all well and good, but really I just like to scare and be scared. But that question got me thinking. Honestly, why do I write this stuff? Well, as a writer, I write what I like to read. So the real question is “Why do I like that stuff?” Here’s why. Michael Schutz’s first book was Robert Louis Stevenson’s A Child’s Garden of Verses. That was also my second, third, and possibly fourth book. As my parents tell it, I kept ripping them to shreds until I finally matured enough to recognize what a book was! Eloise Wilkin Stevenson illustrated the Little Golden Book edition that stayed by my side for many years. Her paintings haunted my childhood. Every one of them found a way into my dreams during my young years. “The Cow” in her field… raking the leaves for those “Autumn Fires.” And recurring semi-nightmares of me on a swing, coming untethered and flying high, high, ever higher into the sky. But of all of them, the last illustration mesmerized me most. 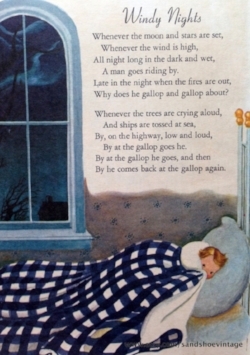 Accompanying “Windy Nights,” a scared little boy tucks his blanket up to his chin as he hides from the galloping… galloping… galloping of a mysterious man riding by (the wind during a storm). Outside the window, ghostly wisps tangle through skeletal trees. A dark house lurks nearby. And the seeds were planted. The next major event occurred sometime around the fourth or fifth grade (I’ve said sixth grade in previous interviews, but upon reflection, this happened earlier) my dad introduced me to The Basement. A used book store tucked away in the actual basement of an old department store. He opened up a magical world for me that day. The boxes of browned and savory old paperbacks held my attention. Remember Alfred Hitchcock Presents… anthologies? And next to those, the works of Ray Bradbury. Something Wicked This Way Comes. Long After Midnight. The October Country. I spent that summer immersed in the fantastic and macabre worlds that Bradbury weaves. They kindled a fire inside me. A celebration of the dark and mysterious. Stories so artfully written and woven together that I couldn’t put them down. Those gristly stories set the stage for a monumental discovery. Browsing through my neighbor’s garage sale, I found The Stand. By some guy named Stephen King. I’d heard the name in passing. He was supposed to be pretty good. I don’t remember, but I suspect that The Stand’s length appealed to me most of all. I craved a long, lasting experience, and that novel promised to deliver it. My ten-year-old self polished that baby off in a week or less. And I swallowed that hook right down my gullet. I suffered the flu right afterward! The next time I pedaled my bike downtown to The Basement, that hook was set. A friend of my parents had regaled us with this creepy story; a book she’d just read about cats dying and coming back to life. Some scary kid pulled from the grave. I asked old Earl the bookkeep if he had a book called Pet Sematary. “Oh,” he said. “Stephen King.” And pulled the paperback down from the shelf. Stephen King had written that one, too? I dropped my fifty cents in his hand and rode home like a boy possessed. Which is exactly what I became after the first couple pages of that book. Those of you who’ve read that one (I hope all of you!) know that that novel is perhaps the darkest of King’s work. A novel he worried would turn off his burgeoning number of fans. Oh, I loved it! That book sent a lightning bolt through this sixth-grader’s skull. I read through all of King’s books and stories over the next couple of years. All I ever wanted to do was write. What better genre for me than horror? From those early illustrations for Stevenson poems, into the masterwork of Bradbury, and finally through the floodgates of Stephen King, the dark and macabre have always drawn me in. Now I can share my own twisted tales with the world. Thanks for reading. Stay dark, my friends.